Classmates I. First those who came first: THE DISAPPEARED. As you surely don’t know, the first phase of the first course “Freedom According to the Zapatistas” has been completed. The support materials are ready; the teachers are ready; the registration spots are filled; the indigenous Zapatista families that will host you are figuring out how many students they will have and building structures, gathering kitchen utensils, and setting up the places where students will sleep; the chaufferologists, as Sub Moisés calls them, are fine-tuning their motors and sprucing up their vehicles to transport students to their schools; the insurgents are weaving and unweaving artisanship; the musicians are practicing their best pieces to liven up the party to celebrate the 10-year anniversary [of the Good Government Councils], the arrival of the students, and the end of the course; and a healthy climate of collective hysteria is evident among all those who support the organization. The lists are being reviewed to see who is missing… or who is present and shouldn’t be; and in CIDECI, site of the Unitierra [University of the Earth] San Cristóbal de las Casas, Chiapas, the preparations for the little school and for the Seminar “Tata Juan Chávez Alonso” are moving forward. And, as was expected, the federal and state governments are reactivating the paramilitaries, encouraging provocations and confrontations, and doing what they do to avoid that you (and others, through you) confirm the advancement of the Zapatista communities, and the stark contrast between Zapatista communities and those communities and organizations who cover themselves with the thin cloak of governmental assistance. It’s predictable, you know. So typical the counterinsurgency manual, so typically ineffective, so useless. So the same as 10, 20, 500 years ago. PRI, PAN, PRD, PVEM, PT, all of the political parties, with imperceptible variations in their discourses, doing the same thing… and reiterating their failure. Who would have thought that all of the governments, of the entire political spectrum, would so fear the improvement of indigenous quality of life? And we understand their nervous restlessness, their poorly disguised panic, because the message that comes from our side is clear and presents a double-edged threat to them: they aren’t necessary… and they are in the way. In sum: there is a lot of movement, inside and outside, by them and by us. And everything, looking at it from the top of this ceiba tree, approximates an orderly disorder (I was going to say a “desmadre,” but those who generously support us with translation to other languages would complain about the abundance of “localisms” that are impossible to translate). I could add that all of this moves seemingly without rhyme or reason, to the rhythms of the ballad-corrido-ranchera-cumbia of the musicians that are a kind of soundtrack to all this movement, and that have a sound that is, to say the least, disconcerting. Now it’s my job to tell you who your classmates will be. Women, men, and ‘others’ of all ages, from different corners of the five continents, from distinct histories. I have climbed the ceiba tree not just because of my fear of being assaulted by an impertinent beetle, a supposed errant knight, or by the melancholic stories of the cat-dog… well, yes also because of this, but most of all because, in order to tell you about those who were invited first, one must look at one’s heart, which is what we the Zapatistas call the act of remembering, making memory. The first on the list to be invited are, and will be, those who have come before us and who have accompanied us in this unfinished path to freedom, the fallen and the disappeared in the struggle. To all of them (male and female) we send a letter of invitation like the one that I annex here. We sent it to them not long ago: yesterday, a month ago, a year ago, 10, 20, 500 years ago. To understand this letter it will be necessary not only to look and listen to the videos that accompany this text, but also necessary will be a certain dose of memory… and of dignified rage. Yes, perhaps you are right. Perhaps this has something to do with the lyrics of Gieco, Benedetti, Heredia, Viglietti, Galeano, the stubbornness of the grandmothers and the mothers of the Plaza de Mayo, the incorruptible dignified courage of the women of Sinaloa and Chihuahua, the pain made into persistent search of the relatives of thousands of disappeared across the continent, with all of these people who are so stubborn, so… admirable. Could be. What is certain is that, in thinking about who could be interested in seeing and listening to us in this act of showing ourselves that we call “the little Zapatista school,” you were the first people that came to mind. All of you. Because despite the fact that we don’t know many of your names, knowing one of you is knowing all of you. So, if someone is to be responsible for these lines, blame it on memory, that continuous and persistently impertinent thing that won’t leave us in peace, that is always at battle, always at war. And this is good, we think, as indigenous, Mayas, Zapatistas. It is good that this war against oblivion does not cease, that it continues, that it grows, that it becomes global. Well yes, it could also be because here we are all a little, or a lot, like the dead, like the disappeared, knocking at the door of history, demanding a place, a small one, small like us. Demanding memory. But it seems to us, after really thinking it over, that the blame lies with memory. Yes of course, also with oblivion. Because it is oblivion that stalks, attacks, conquers. And it is memory that keeps vigil, defends, resists. That is why we’re making this invitation. Where will we send it you ask? Yes, that was a problem. Don’t think we didn’t think about that quite a bit. Was it because of you all that we called this course “Freedom According to the Zapatistas”? In order to have a place to send the invitation? Well, that hadn’t occurred to us, but now that you mention it, yes, that could be. We would thus avoid the mess of looking for addresses, post offices, email addresses, blogs, webpages, nicknames [English in the original], social networks, and all of these things for which our ignorance is encyclopedic. You know what? There has been here, and continue to be, not just a few difficult moments. Moments in which it seems that everyone and everything is against us. Moments in which thousands of reasons, sometimes dressed mortally in lead and fire and sometimes dressed finely in comfortable conformist arguments, have attacked us from all sides trying to convince us of the advantages of giving up, selling out, surrendering. If we didn’t succumb, it wasn’t because we were so powerful and had a great arsenal (of weapons or dogmas, as the case may be). It was because we are made up of you, by your memory. You already know of our obsession with calendars and geographies, our very ‘other’ way of understanding ourselves and the world. Well, here memory is not a question of one day’s ephemera that serves as an alibi for forgetting during the rest of the year. It is not a question of statues, monuments, or museums. It’s, how could I tell you… something less fussy, with less pomp and circumstance. Something quieter, barely a murmur…but constant, stubborn, and collective. Because here, another way of saying that we do not forgive nor forget, is to not give up, to not sell out, to not surrender. Yes, agreed, it is not very “orthodox,” but what can you do. It’s one of our ways… or anyways… depending. So, we wait for you here. This letter we remit then to “the country of freedom,” the only nation with no borders but with every flag… or no flag (which isn’t the same but is equal nonetheless), and which is the most difficult nation to get to… maybe because the only road there is memory. We know the current impossibility of you coming to our communities, and sending you the preparatory materials is problematic. But in any case, now, the same as yesterday and tomorrow, you have a special place with us. Perhaps we will run into each other sooner than planned…or as planned…knocking on some door or peering out a window, but always opening the heart. In the meantime, don’t forget that when the Zapatistas say “here we are,” we include you in that statement. Vale. Cheers and let memory resist, that is, live. Because alive they took you and alive we want you back. 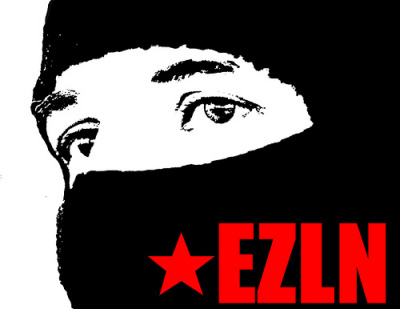 In the name of all of the Zapatistas of the EZLN. (End of the letter-invitation to the fallen and disappeared in the struggle for freedom). So now you know who will be among your fellow students. They’ll be around here. No, they won’t scare anyone. Well, unless someone fears memory and comes looking for forgetting. But since I don’t believe this will be the case, you don’t have anything to worry about. Ask: With whom will all this be done? And it will respond: With you. Ask: For whom is this effort? And it will respond: For you. Ask: Who made it possible? And, maybe with a light tremor, you will hear: You. Ask: For who is this path? So now you know: when you are here in these mountains of the Mexican Southeast, where it rains, it blows, the sky covers or discovers its light, and the earth becomes wet, it will be because, at the foot of the mother ceiba, the sustainer of the world, someone is asking questions…and most importantly, because they are receiving answers. What comes next then? Well, it seems to me that it will be up to you to tell that story. Vale. Cheers and let memory neither fall nor disappear. From one corner of memory. Mario Benedetti, always welcome, and Daniel Viglietti, sing, that is, yell for the disappeared, about the disappeared, with the disappeared. Dedicated to the mothers and grandmothers who don’t give up, don’t give in, and don’t sell out. Once again Mario Benedetti, emphasizing, with his voice, the impossibility of forgetting. Dedicated to those who don’t forget. León Gieco sings, a song of his own writing, “La Memoria,” that stubborn, relentless, fierce memory of those who are not here, but have not gone, nor will they go… as long as there is someone who doesn’t forget them. León Gieco with his song “El País de la Libertad” (The Country of Freedom), that address to which memory must be directed. Víctor Heredia explains why “We still sing,” that is, why we don’t forget.